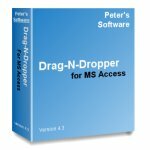 Drag-N-Dropper consists entirely of Access objects and VBA code so it is easy to distribute with your Access application. v5.11 - Access 2013 trial version included in download, Bug that caused listbox re-ordering to fail in some situations fixed. v5.10 - Access 2010 64-bit support, and some bug fixes (see readme.txt file for details). v5.9 - More bug fixes. v5.8 - Reordering bug fix for forms with a header section. v5.7 - Supports dragging on pop-up forms, bug fixes. v5.6 - Includes support for Access 2007, Windows Vista, dragging between continuous forms, and any font/fontsize combination. Drag-N-Dropper is licensed on a company-wide basis. If you incorporate Drag-N-Dropper into an application you develop for distribution outside of your company, an unlimited license is required. 10/11/13 - The trial download now includes a demo database for Access 2013 64-bit.